I recently had the joy of teaming up with my fave hostess with the mostess, Kim Mower. The soon to be mother of three and I have been planning parties together since the dark ages (aka before Pinterest and Etsy). We recently joined forces again to plan her one year old son's first birthday party. 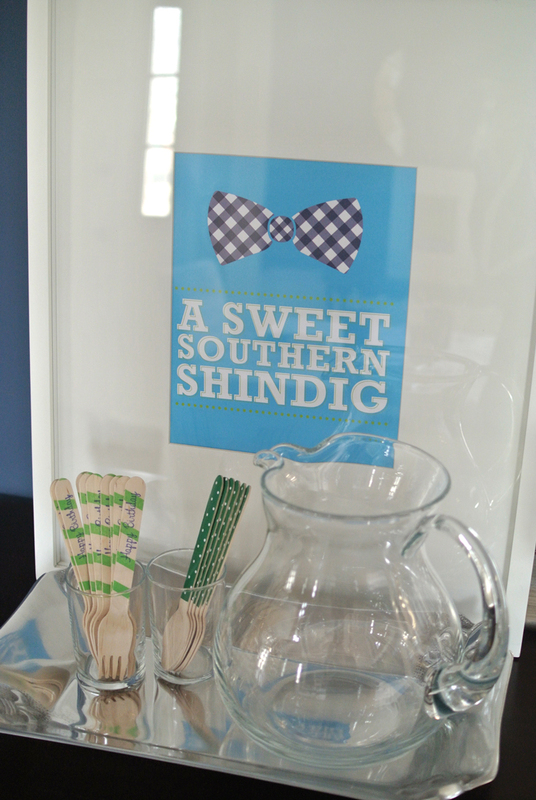 The theme: a sweet southern shindig - where you dress in the latest Vineyard Vines ensemble and eat fried chicken too. The invites played a BIG part in the event. They were a jumbo ONE in an oversized envelope, complete with monogrammed envelope liners. The jumbo one motif played throughout the party and welcomed everyone to Mower Manor. The place settings were decked out with custom plates, napkin wraps, monogrammed cups and oh-so-cute wooden utensils. I don't know what it is about wooden utensils but they really up the ante of a party! The cutest monogrammed cake was complete with a personalized cake banner. The "Happy Birthday Reid" Bunting hung above the dining area. I'm sure it made the fried chicken taste that much better! No party is complete without a custom poster or two! The cake backdrop and photo-op. Reid gave everything a huge round of applause! And of course a southern gentleman would never forget his manners. The thank you's rounded out the event.